Bill, Max. Form: A Balance Sheet of Mid-Twentieth-Century Trends in Design. New York: Wittenborn, 1952. Bill, Max, Gerd Fleischmann, Hans Rudolf Bosshard, and Christoph Bignens. Max Bill: Typografie, Reklame, Buchgestaltung = Typography, Advertising, Book Design. Zürich: Niggli, 1999. Bosshard, Hans Rudolf. “Concrete Art and Typography.” In Typography, Advertising, Book Design. Zurich: Niggli, 1999. Brand, Stewart, ed. Whole Earth Catalog: Access to Tools. Menlo Park, CA: Portola Institute, 1970. Brook, Tony, and Adrian Shaughnessy, eds. Wim Crouwel: A Graphic Odyssey. Tokyo: BNN Inc., 2012. Crouwel, Wim. Kunst + Design: Wim Crouwel. Ostfildern: Edition Cantz, 1991. Fetter, William A. Computer Graphics in Communication. New York: McGraw-Hill, 1965. Fuller, R. Buckminster. Operating Manual for Spaceship Earth. New York: Simon & Schuster, 1969. Gerstner, Karl. Compendium for Literates: A System of Writing. Cambridge: MIT Press, 1974. Gerstner, Karl. The Forms of Color: The Interaction of Visual Elements. Trans. Dennis A. Stephenson. Cambridge: MIT Press, 1986. Gioni, Massimiliano, and Gary Carrion-Murayari, eds. Ghosts in the Machine. New York: Rizzoli, 2012. Heller, Steven. “Sutnar & Lönberg-Holm: The Gilbert and Sullivan of Design.” In Graphic Design Reader. New York: Allworth Press, 2002. Hill, Anthony, ed. Data: Directions in Art, Theory and Aesthetics. Greenwich, CT: New York Graphic Society Ltd., 1968. Hollis, Richard. Swiss Graphic Design: The Origins and Growth of an International Style, 1920–1965. New Haven: Yale University Press, 2006. Hüttinger, Eduard, ed. Max Bill. New York: Rizzoli, 1978. Knobloch, Iva, ed. Ladislav Sutnar V Textech (Mental Vitamins). Prague: Nakladatelstvi KANT a Umeckoprumyslové museum v Praze, 2010. Knuth, Donald E. Computer Modern Typefaces. Boston: Addison-Wesley, 1986. Knuth, Donald E. Digital Typography. Stanford: CSLI Publications, 1999. Kröplien, Manfred, ed. Karl Gerstner: Review of 5×10 Years of Graphic Design, etc. Ostfildern: Hatje Cantz Verlag, 2001. LeWitt, Sol. “Paragraphs on Conceptual Art.” Artforum 5, no. 10 (1967): 79–83. Maldonado, Tomás. Max Bill. Buenos Aires: Editorial Nueva Visión, 1955. Munari, Bruno. Design as Art. Trans. Patrick Creagh. London: Penguin, 1971. Nelson, Theodor H. Computer Lib: You Can and Must Understand Computers Now. Chicago: Hugo’s Book Service, 1974. Price, Marla. Drawing Rooms: Jonathan Borofsky, Sol LeWitt, Richard Serra. Fort Worth: Modern Art Museum Fort Worth, 1994. Rosen, Margit, ed. A Little-Known Story About a Movement, a Magazine, and the Computer’s Arrival in Art: New Tendencies and Bit International, 1961–1973. Cambridge: MIT, 2011. Sutherland, Ivan E. “Sketchpad, a Man-Machine Graphical Communication System,” Doctoral dissertation, Massachusetts Institute of Technology, 1963. Time-Life. “Toward a Machine with Interactive Skills.” In Computer Images 34. Ann Arbor: University of Michigan, 1986. Turner, Fred. From Counterculture to Cyberculture: Stewart Brand, the Whole Earth Network, and the Rise of Digital Utopianism. Chicago: University of Chicago Press, 2008. Zevi, Adachiara, ed. Sol Lewitt: Critical Texts. Rome: Libri de AEIUO, 1995. Aldersey-Williams, Hugh, Lorraine Wild, Daralice Boles, and Katherine McCoy. The New Cranbrook Design Discourse. New York: Rizzoli, 1990. Barthes, Roland. Image-Music-Text. London: Fontana, 1977. Blackwell, Lewis. The End of Print: The Graphic Design of David Carson. San Francisco: Chronicle Books, 1995. Brooks Jr., Frederick P. The Mythical Man-Month: Essays on Software Engineering. Boston: Addison-Wesley Professional, 1995. Debord, Guy. The Society of the Spectacle. New York: Zone, 1995. Derrida, Jacques. Of Grammatology. Baltimore: Johns Hopkins University Press, 1997.
ella, Edward. Edward Fella: Letters on America. London: Lawrence King, 2000. Foster, Hal, ed. The Anti-Aesthetic: Essays on Postmodern Culture. New York: New Press, 1998. Foster, Hal, ed. Postmodern Culture. London: Pluto Press, 1985. Friedman, Dan. Dan Friedman: Radical Modernism. New Haven: Yale University Press, 1994. Gay, Joshua, ed. Free Software, Free Society: Selected Essays of Richard M. Stallman. Boston: Free Software Foundation, 2002. Greiman, April. Hybrid Imagery: The Fusion of Technology and Graphic Design. New York: Watson-Guptill, 1990. Hamm, Steve. The Race for Perfect: Inside the Quest to Design the Ultimate Portable Computer. New York: McGraw Hill, 2009. Harvey, David. The Condition of Postmodernity: An Enquiry into the Origins of Cultural Change. Cambridge, MA: Blackwell, 1990. Hofstadter, Douglas R. Gödel, Escher, Bach: An Eternal Golden Braid. New York: Basic Books, 1999. Kostelanetz, Richard. A Dictionary of the Avant-Gardes. New York: Routledge, 2001. Laurel, Brenda, ed. The Art of Human-Computer Interface Design. Boston: Addison-Wesley, 1990. Levy, Steven. Insanely Great: The Life and Times of Macintosh, the Computer that Changed Everything. London: Penguin, 2000. Lupton, Ellen, and Abbott Miller. Design Writing Research: Writing on Graphic Design. New York: Kiosk, 1996. Lyotard, Jean-François. The Postmodern Condition: A Report on Knowledge. Manchester: Manchester University Press, 1984. Makela, P. Scott, and Laurie Haycock Makela. Whereishere: A Real and Virtual Book. Berkeley: Gingko Press, 1998. McLuhan, Marshall, and Quentin Flore. The Medium Is the Message: An Inventory of Effects. Corte Madera, CA: Ginko Press, 2001. Miller, J. Abbott. Dimensional Typography: Case Study on the Shape of Letters in a Virtual Environment. New York: Princeton Architectural Press, 1996. Norris, Christopher. Deconstruction: Theory and Practice. New York: Routledge, 1991. Poynor, Rick. No More Rules: Graphic Design and Postmodernism. New Haven: Yale University Press, 2003. Raymond, Eric S. The Cathedral and the Bazaar: Musings on Linux and Open Source by an Accidental Revolutionary. Sebastopol, CA: O’Reilly Media, 1999. Rock, Michael. “P. Scott Makela Is Wired.” Eye 12 (1994): 26–35. Ronell, Avital. The Telephone Book: Technology, Schizophrenia, Electric Speech. Lincoln: University of Nebraska Press, 1989. VanderLans, Rudy, and Zuzana Licko. Emigre: Graphic Design into the Digital Realm. New York: Van Nostrand Reinhold, 1993. Weingart, Wolfgang. Typography. Baden: Lars Müller, 2000. Anderson, Chris. Free Culture: How Big Media Uses Technology and the Law to Lock Down Culture and Control Creativity. New York: Penguin, 2004. Anderson, Chris. Makers: The New Industrial Revolution. New York: Crown, 2012. Armstrong, Helen, ed. 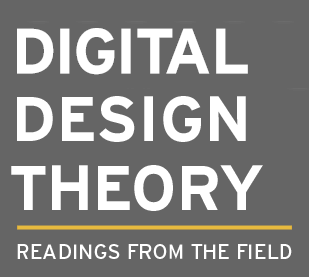 Graphic Design Theory: Readings from the Field. New York: Princeton Architectural Press, 2009. Armstrong, Helen, and Zvezdana Stojmirovic. Participate: Designing with User-Generated Content. New York: Princeton Architectural Press, 2011. Blauvelt, Andrew, and Koert van Mensvoort. Conditional Design: Workbook. Amsterdam: Valiz, 2013. Bohnacker, Hartmut. Generative Design: Visualize, Program, and Create with Processing. New York: Princeton Architectural Press, 2012. Brand, Stewart. Whole Earth Discipline: Why Dense Cities, Nuclear Power, Transgenic Crops, Restored Wildlands, and Geoengineering Are Necessary. New York: Viking, 2009. Cormen, Thomas H., and Charles E. Leiserson. Introduction to Algorithms. Cambridge: MIT Press, 2009. Dunne, Anthony, and Fiona Raby. Speculative Everything: Design, Fiction, and Social Dreaming. Cambridge: MIT Press, 2013. Fry, Ben, and Casey Reas. “Processing: Programming for Designers and Artists.” Design Management Review (2009): 52–58. Fuller, Matthew. Behind the Blip: Essays on Software Culture. New York: Autonomedia, 2003. Fuller, Matthew, ed. Software Studies: A Lexicon. Cambridge: MIT Press, 2008. Graham, Paul. Hackers and Painters: Big Ideas from the Computer Age. Sebastopol, CA: O’Reilly, 2004. Greenfield, Adam. Everyware: The Dawning Age of Ubiquitous Computing. Berkeley: New Riders, 2006. Hunt, Andrew, and David Thomas. The Pragmatic Programmer: From Journeyman to Master. Boston: Addison-Wesley Professional, 1999. Jenkins, Henry, Sam Ford, and Joshua Green. Spreadable Media: Creating Value and Meaning in a Networked Culture. New York: NYU Press, 2013. Knuth, Donald E. The Art of Computer Programming. Boston: Addison-Wesley Professional, 2011. Laurel, Brenda. Computers as Theatre. Boston: Addison-Wesley Professional, 2013. Laurel, Brenda. Utopian Entrepreneur. Cambridge: MIT Press, 2001. Laurel, Brenda, and Peter Lunenfeld. Design Research: Methods and Perspectives. Cambridge: MIT Press, 2003. Lessig, Lawrence. Free Culture: The Nature and Future of Creativity. New York: Penguin Books, 2005. Levy, Steven. Hackers: Heroes of the Computer Revolution. Sebastopol, CA: O’Reilly Media, 2010. Lunenfeld, Peter. The Secret War Between Downloading & Uploading: Tales of the Computer as Culture Machine. Cambridge: MIT Press, 2011. Lupton, Ellen. Type on Screen: A Critical Guide for Designers, Writers, Developers & Students. New York: Princeton Architectural Press, 2014. Maeda, John. Maeda @ Media. New York: Rizzoli, 2000. Maeda, John. The Laws of Simplicity (Simplicity: Design, Technology, Business, Life). Cambridge: MIT Press, 2006. Malloy, Judy, ed. Women, Art, and Technology. Cambridge: MIT Press, 2003. Myers, William, ed. Bio Design: Nature + Science + Creativity. New York: Museum of Modern Art, 2014. Nelson, Theodor H. Designing Interactions. Cambridge: MIT Press, 2007. Pearson, Matt. Generative Art: A Practical Guide Using Processing. Shelter Island, NY: Pearson Education, 2010. Petzold, Charles. Code: The Hidden Language of Computer Hardware and Software. Redmond, WA: Microsoft Press, 2001. Poggenpohl, Sharon, and Keiichi Sato, eds. Design Integrations: Research and Collaboration. Bristol, UK: Intellect, 2009. Reas, Casey, Chandler McWilliams, and LUST. Form + Code in Design, Art and Architecture. New York: Princeton Architectural Press, 2010. Reas, Casey, and Ben Fry. Getting Started with Processing. Sebastopol, CA: Maker Media, 2010. Rose, David. Enchanted Objects: Design, Human Desire, and the Internet of Things. New York: Scribner, 2014. Salen, Katie, and Eric Zimmerman, eds. The Game Design Reader: A Rules of Play Anthology. Cambridge: MIT Press, 2006. Sterling, Bruce. Shaping Things. Cambridge: MIT Press, 2005. Vinh, Khoi. Ordering Disorder: Grid Principles for Web Design. Berkeley: New Riders, 2010.